Dr. Avinash Sathaye of Kentucky University has been a very benevolent commentator on my lessons. When I said, in the prologue of Lesson # 51 “..I remain ever-obliged to learned people who have been offering valuable comments and giving great guidance in this project of mine..” very honestly his name was uppermost in my mind. His comment is here below my grateful acknowledgment of his comment. 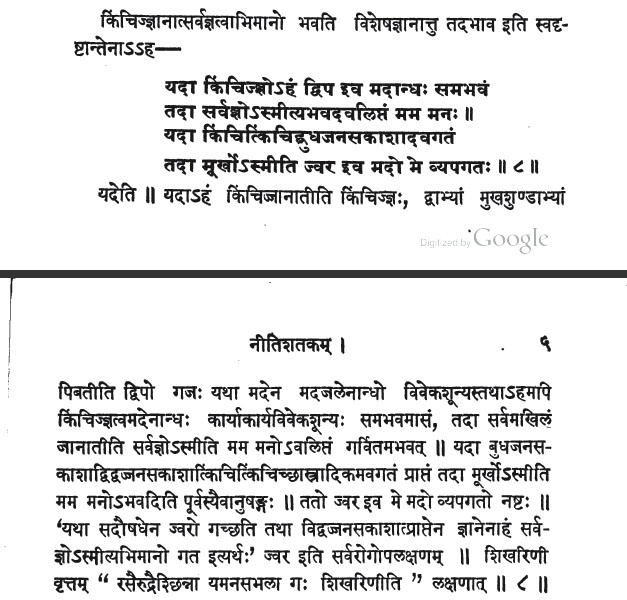 My acknowledgment is in Sanskrit, only because I would not like to miss any opportunity to communicate in Sanskrit. नमो नमः श्रीमन् “अविनाश साठये”-महोदय ! there are two typos which have caused all your problems here. This has a serious typo, namely किञ्चित्झः. It led to an incorrect translation. I don’t know where you found a meaning for झः. There is another serious typo which also led to your problem with the meter. Thus, the contrast is that those who know very little, think they know it all. Those who start learning step by step understand how far they are from perfection! BTW, you have named कालिदास so it would be appropriate to give credit to भर्तृहरि and his नीतिशतक. This one belongs to him! P.S. BTW, अनुलिप्त does not have the intended meaning that is given by अवलिप्त. And even in the image shows ज्ञ It just the dark spots making it look like a झ .